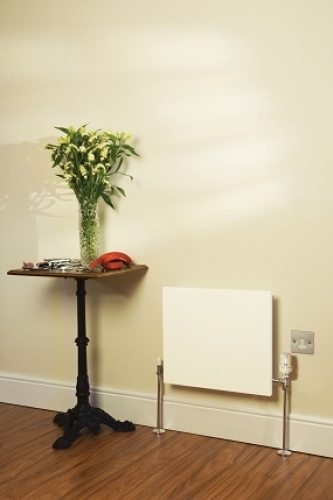 Smaller than a radiator, yet bigger on output, this fan convector combines elegant good looks with energy efficiency. 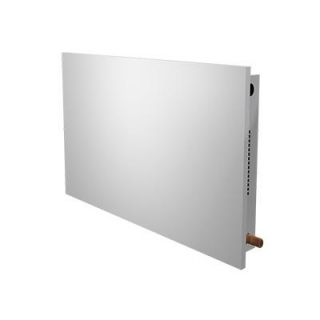 Providing warmth from the floor upwards – the ideal heating pattern – the Eco-Powerad fan convector is up to 31% more efficient than an equivalent output radiator and will operate effectively on wet central heating systems. Fan convector technology allows the central heating system to operate at temperatures as low as 40°C enabling heat pumps to run at their higher efficiencies and to generate SAP improvements of 7.5% over traditional radiators. Eco-Powerad installs just like a radiator using the same pipe work and valves but is less than half the weight and takes up a much smaller footprint making it easier to handle in both existing and new developments. Simple to operate, Eco-Powerad fan convectors switch on and off automatically with the central heating system, and with the addition of thermostatic radiator valves they will provide efficient room temperature control.